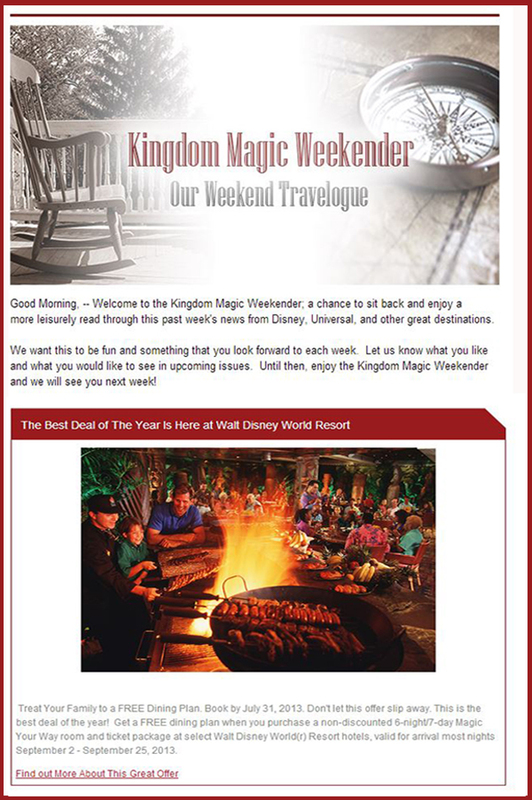 The Weekender Newsletter is a free, weekly mailing that allows you to explore and enjoy the latest information and news about Walt Disney World Resort, Disneyland, Universal Orlando, Disney Cruise Line, and other great vacation destinations. From Walt Disney World, Disney Cruise Line, Adventures by Disney, Universal Studios Orlando, and several incredible vacation destinations, we cover a wide range of useful information that will help you plan your magical vacation. From healthy eating to traveling safely, Kingdom Magic provides great tips and suggests for how to travel like a pro! Each week you never know where Travel with Rick will be next, it could a theme park, resort, or an incredible dining experience. It’s always great to see where Rick will be and he takes us there with him! I had a wonderful surprise opening my e-mail this morning! This is the first e-mail I’ve received from you. I’m enjoying it. Thanks!! This is a great newsletter. Full of wonderful and useful information. I love it. So sign up now and receive our next issue.